Here is another sketch of my favourite Doctor Who, the 12th Doctor Peter Capaldi. 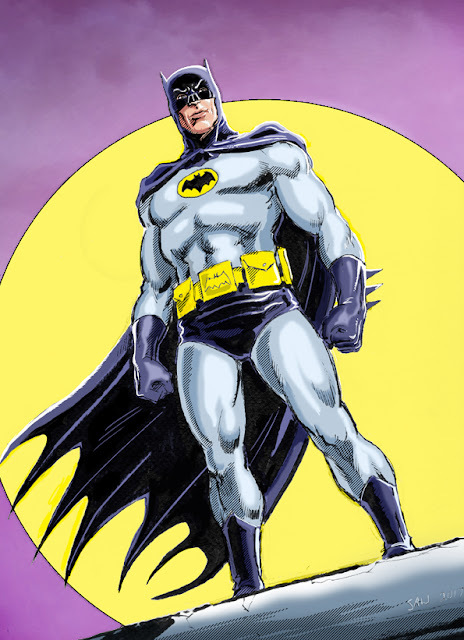 The original sketch was drawn in Pencil and ink, and coloured in Photoshop with a digitally created montage background. * If you wrote the text featured on the Wikia page, let me know and I'll credit you, yes? Happy 30th Anniversary Death's head! This year marks the 30th anniversary of the creation of one of the greatest UK comic characters of all-time, Death's Head! 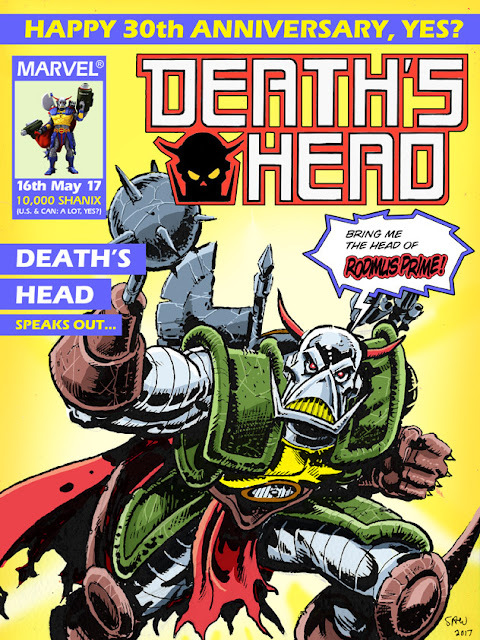 Created by writer Simon Furman and artist Geoff Senior, Death's Head made his debut appearance in Marvel UK's Transformers issue 113. Since then, he has appeared in many different forms and incarnations... but it is the original that has endured in the hearts of fans. Here is a piece of artwork I've produced, which is a homage to Geoff Senior's cover to TF 113. 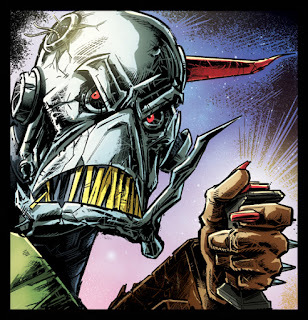 On a personal note, it's been a dream come true as a long time fan turned professional comic artist to have been able to contribute to the history of Death's Head, even if in just a small way. So I'd like to say a huge "Thank you" to Stubbies Furman and Senior for giving us such a memorable character... I have a feeling this Freelance peacekeeping Agent will be in business for many years to come! Artwork by Stubbie Williams, yes? I'm going to miss Peter Capaldi when he steps away from the Tardis in the upcoming Doctor Who Christmas special. Peter is my favourite Doctor Who (even over Tom Baker, and I never thought that would happen! ), and have really enjoyed his time as the Doctor. 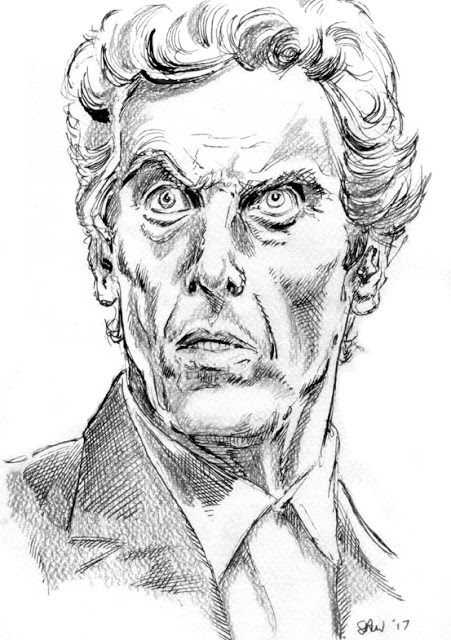 Here's a late night sketch I did last night, of the 12th Doctor. 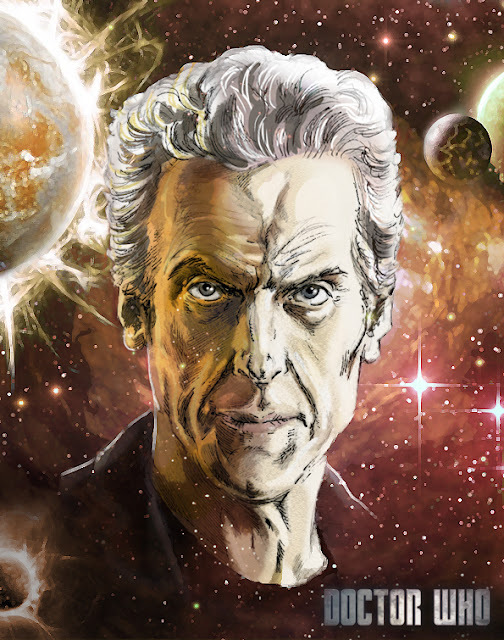 Thank you Peter Capaldi! May those Attack Eyebrows never dull, and bottle tops beware all over time and space for many years to come! Peter Capaldi as the 12th Doctor. 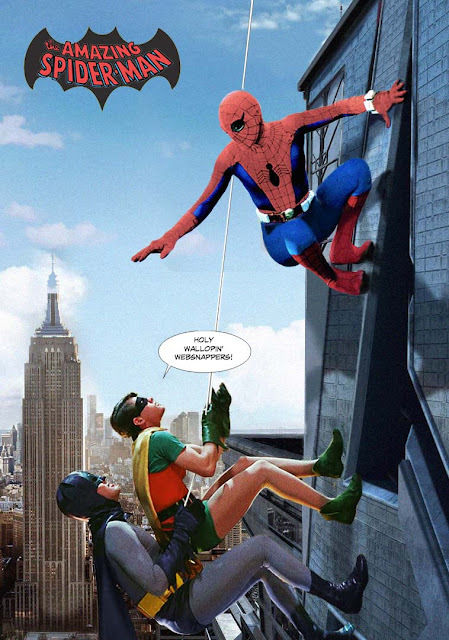 UPDATE: I've just added an alternate version featuring the 1970's live-action (and my personal favourite) on-screen Spidey, Nicholas Hammond. So, turn up that Dana Kaproff soundtrack, and enjoy! The Mighty World of Marvel! I received a comment last night on Twitter saying that my Hulk piece had a classic Mighty World of Marvel feel to it. 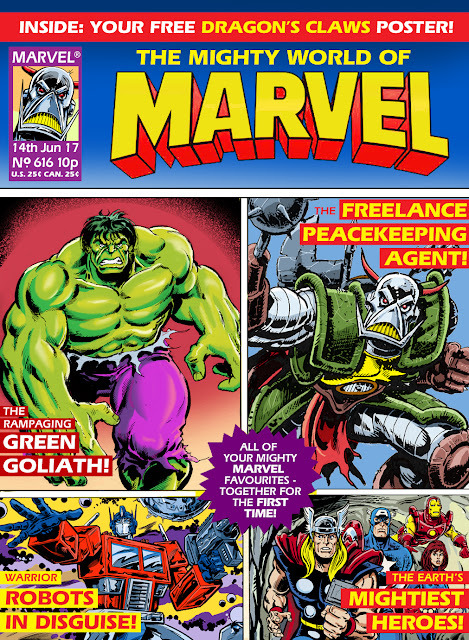 The Mighty World of Marvel is of course, the classic 1970's Marvel UK title that started my love for comics (and of course, the Hulk!) in the first place. So, I decided to put this together... just for fun! UPDATE: I've also added an 80's style Marvel UK version below. Still only 10p! Yes, True Believers... at one time, you could get all this for 10p!!! Adam West, known and beloved by many fans across the world as the legendary Batman sadly passed away this weekend. Many, like myself, grew up watching the adventures of Batman in the classic 1966 TV series, where, alongside Burt Ward as Robin the Boy Wonder (and later joined by Yvonne Craig as Batgirl), fought the dastardly delightful gallery of villainy, which included the Joker (Caesar Romero), the Riddler (Frank Gorshin), the Penguin (Burgess Meredith), and the feline femme fatale Catwoman (portrayed by the beautiful Julie Newmar, with the equally beautiful Lee Meriwether and Eartha Kitt later taking on the role). In 2016, Adam reunited with both Burt Ward and Julie Newmar to reprise the role in the highly entertaining DC Animated feature Batman: Return of the Caped Crusaders... as well as providing the voice of Batman in Lego Batman 3: Beyond Gotham. 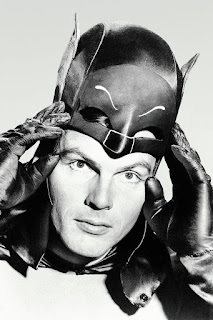 My first memory is actually watching Batman, and to this day Adam West is still my favourite portrayal of the character. My thoughts and condolences go out to Adam's friends, family, colleagues and fans at this sad time. My tribute to Adam West, who will always be my favourite Batman. The Rock and Smash Express! I'm a huge fan of the one and only Jim Cornette, legendary wrestling manager and personality from the days of the NWA (National Wrestling Alliance), Smokey Mountain Wrestling, and the WWE (then known as the World Wrestling Federation)... where he managed the likes of Yokozuna, Vader, the British Bulldog and the late, great Owen Hart. For a large part of Jim's career, he managed the legendary Midnight Express tag-team in their wars with the recently inducted WWE 2017 Hall of Famer's Ricky Morton and Robert Gibson, the Rock N' Roll express. Jim is certainly one of the all-time great managers in professional wrestling... and one of my favourites when it comes to cutting a promo! 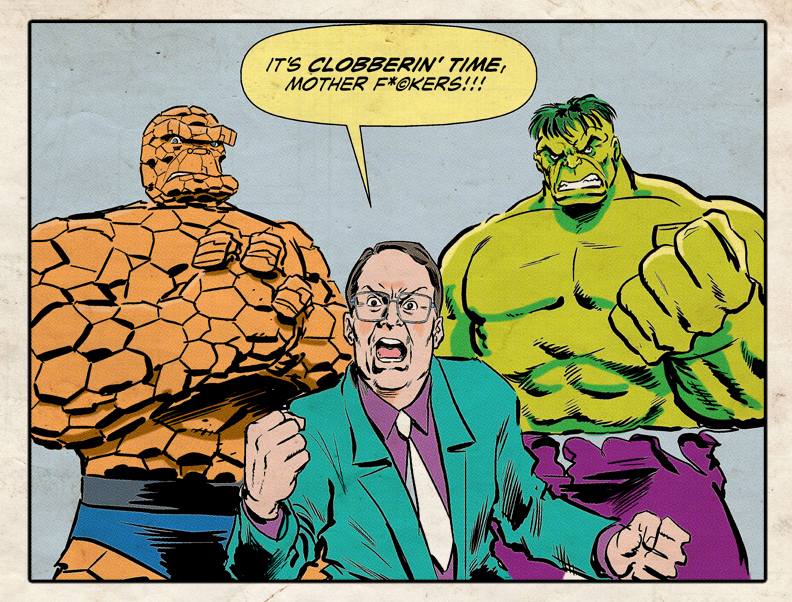 "It's Clobberin' time, Mother Forkers!" You can find the Jim Cornette Experience, Drive-Thru and 6:05 Podcasts on various podcast providers including iTunes, and also check out the Arcadian Vanguard channel on YouTube, for classic clips from all shows! 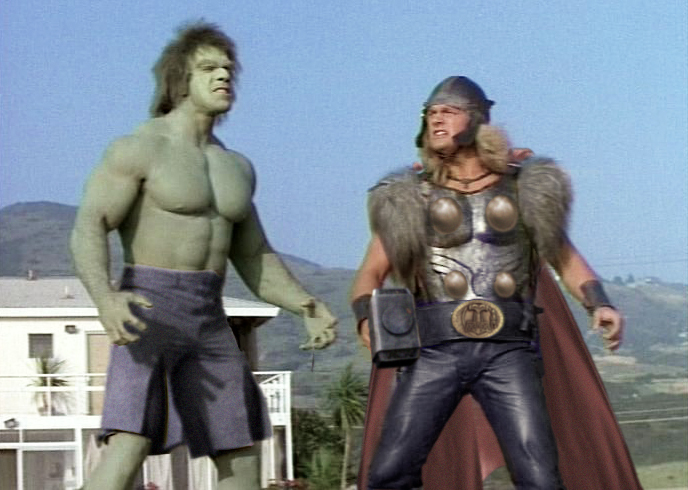 The Incredible Hulk Returns... with the Mighty Thor! 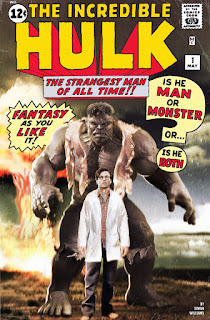 I've always loved the Incredible Hulk TV series, ever since it's debut in 1978. For me, the team of Bill Bixby and Lou Ferrigno will always be the definitive on-screen Banner and Hulk. 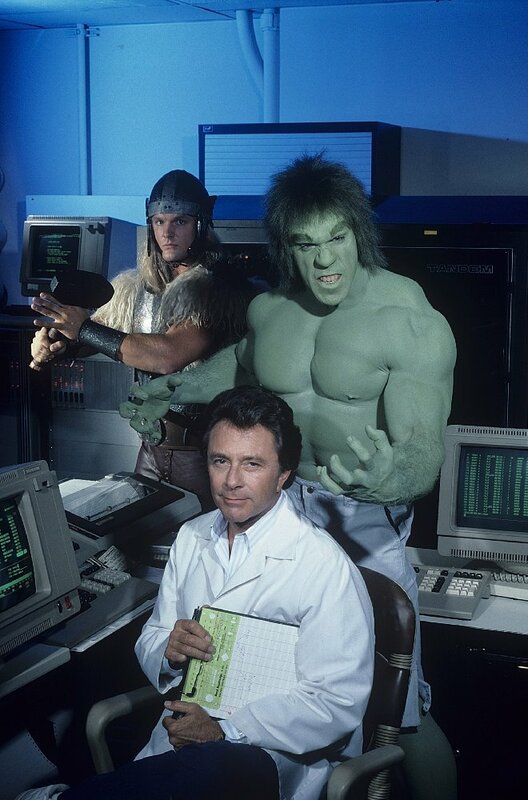 Roll on to 1988, several years after the series cancellation in 1982... they announced the 1988 TV movie the Incredible Hulk Returns, which would not only reunite Bill Bixby's David Banner with his raging alter-ego (hounded as always by Jack Colvin's Jack McGee) - but the show would feature the Hulk teaming up with none other than the Mighty Thor!!! As a young Marvel fan, it was the coolest thing imaginable seeing TWO Marvel characters battling on the big screen... something which is pretty much normal in today's Marvel Cinematic Universe. Thor was played by actor Eric Allan Kramer, whose portrayal of the Thunder God, while different from the comics, was still one heck of a lot of fun! Plus physically, he LOOKED like Thor! The costume, again different from the classic comic-book version, received a bit of criticism from both fans and comic pros, but looking at it, there were elements there that still made it Thor! I thought I would make some amendments to the costume via Photoshop (plus add some of ol' Greenskins trademark purple pants onto Big Lou!). By simply changing the colours, adding chest plates and a cape, I think this would have made a perfect TV costume for the Mighty Thor! So there you have it. 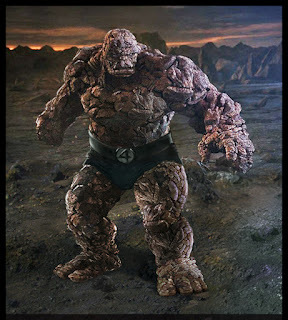 Marvel's first ever live-action team-up. The film may be a far-cry from today's CGI Hulk and Chris Hemsworth's charismatic Thunder God... but back in it's day, the joy of seeing these two Marvel characters was this Marvel fans dream come true! Thor costume by yours truly, courtesy of Photoshop. Dreams CAN come true, yes? It's no secret that two of my all-time favourite characters in comics are the Incredible Hulk and Death's Head. 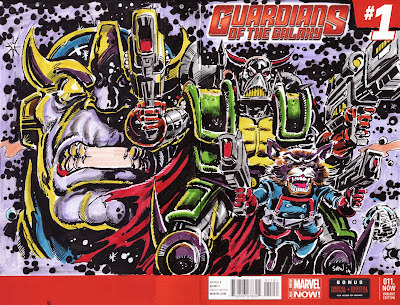 By the time Death's Head got his own comic back in the late 80s', he had transitioned from the Transformers Universe (where he made his debut) to the Marvel Universe (via, of all people... the 7th Doctor!). 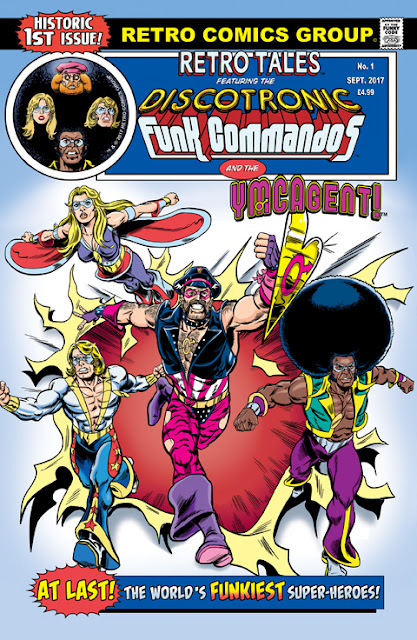 This meant that the Freelance Peacekeeping Agent crossed paths with the likes of the Fantastic Four and Iron Man 2020, and then guest-starred in Walt Simonson's Fantastic Four run, and an issue of She-Hulk (written by Simon Furman, and drawn by Bryan Hitch... both familiar with the character for obvious reasons, yes?). This led to me drawing my own stories featuring Death's Head in what was my dream-battle: fighting the Incredible Hulk. 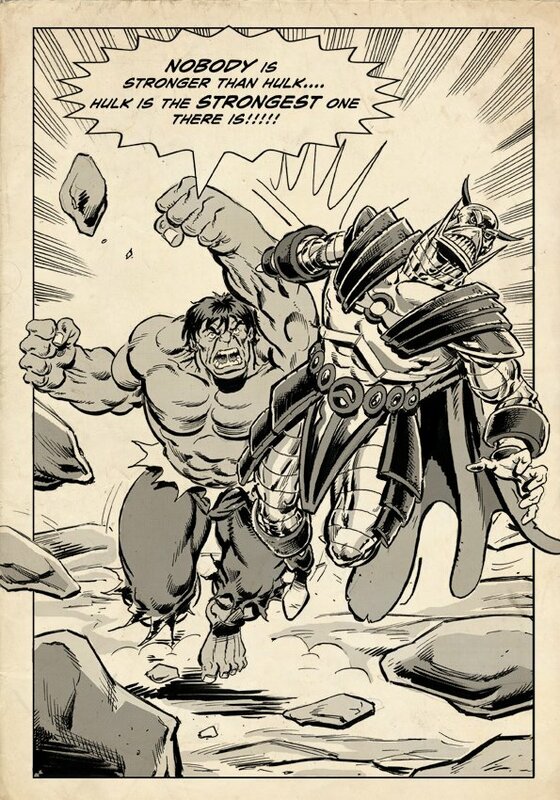 I always hoped that this was something that would happen... but when the original was destroyed, and replaced by Death's Head II, it seemed very unlikely that it would ever take place (note: Death's Head II DID fight the Hulk in an issue of Battle-Tide II... but it wasn't the same, as DH was a completely different character by then). yes? 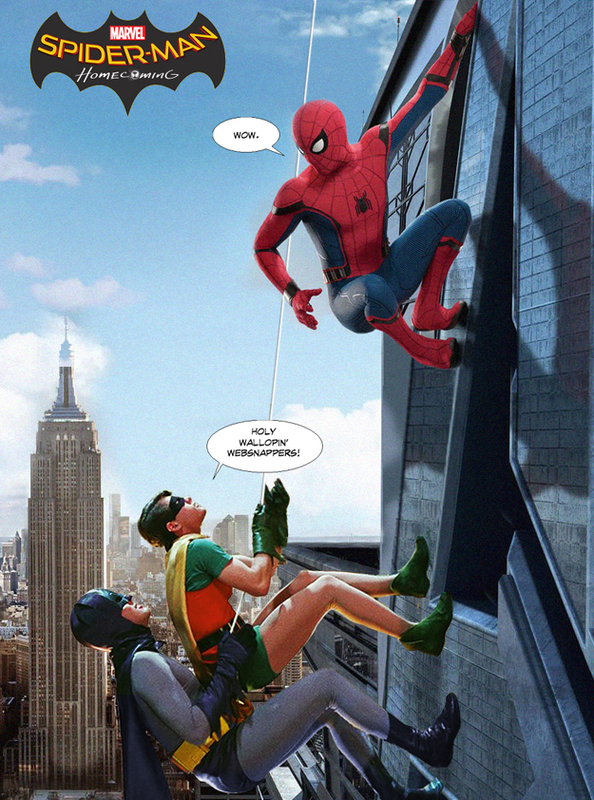 From Spectacular Spider-Man (UK) no. 115. Fast forward to the 2010s (the tensies?!). 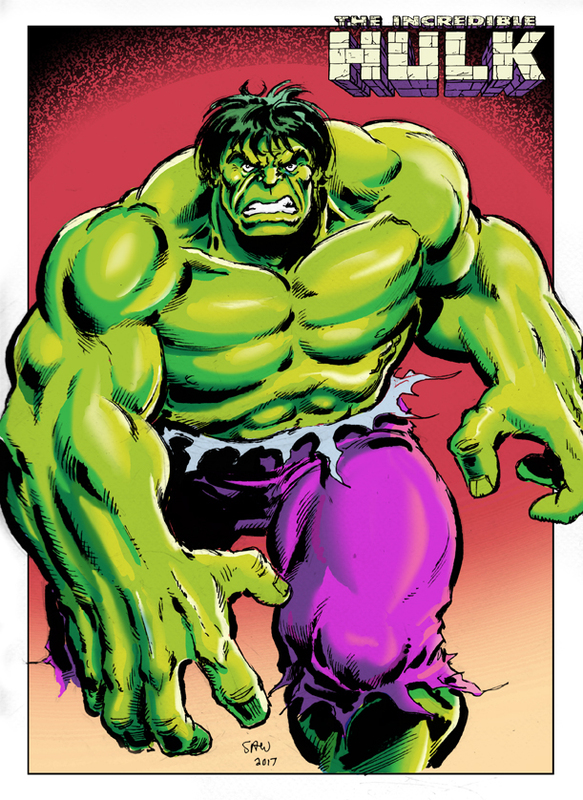 I was now a professional comic artist... living the dream, and drawing my favourite Marvel heroes! I got my start at Panini Comics in 2003, who had taken over the reigns of Marvel UK. 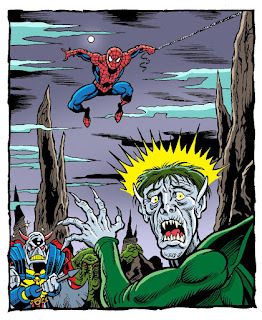 This led to a run on their SPECTACULAR SPIDER-MAN ADVENTURES book, where I got to draw Spidey teaming up with the likes of the Fantastic Four, X-Men, Iron Man, Thor, Doctor Strange and also the Incredible Hulk! 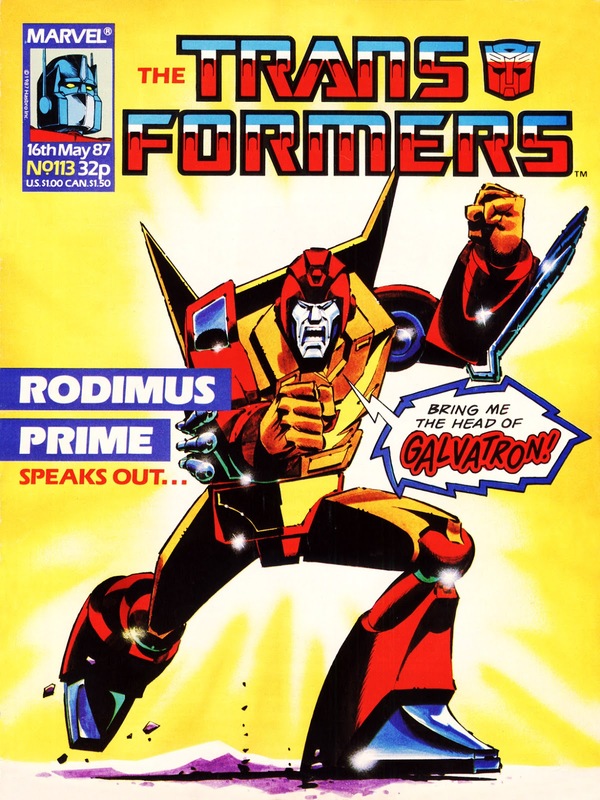 At this time, the character of Death's Head was in limbo... and hadn't seen print since the mid 90's. This led to me constantly nagging my editors (apologies to Ed Hammond and Brady Webb!) to let me draw Death's Head into a Spider-Man comic. At the time, the powers that be didn't feel they could make that happen (despite Ed and Brady being HUUUGE fans of Death's Head! ), so I had to be content with sneaking the time-travelling Freelance Peacekeeper into a couple of issues in background cameos. 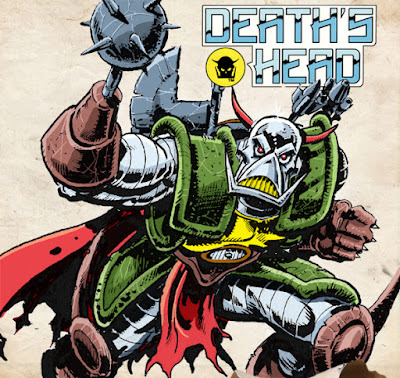 However, this did lead to me producing artwork for the 2 Death's Head collections from Panini... which made me an official Death's Head artist. Finally, yes? I still needed to scratch that Hulk vs DH itch though, so I drew up my own story, which was part of my Soulman Inc Sketchbook back in 2009. This featured Death's Head, as he appeared in his own title versus the classic, savage Incredible Hulk... in a black and white strip which was my love-letter to the old 70's Marvel UK comics. It even featured a cameo of the 4th Doctor and K9! This proved to be popular enough, and got some great feedback from fans and fellow pros alike. Roll on two years, where I had an email that would make everything worthwhile. 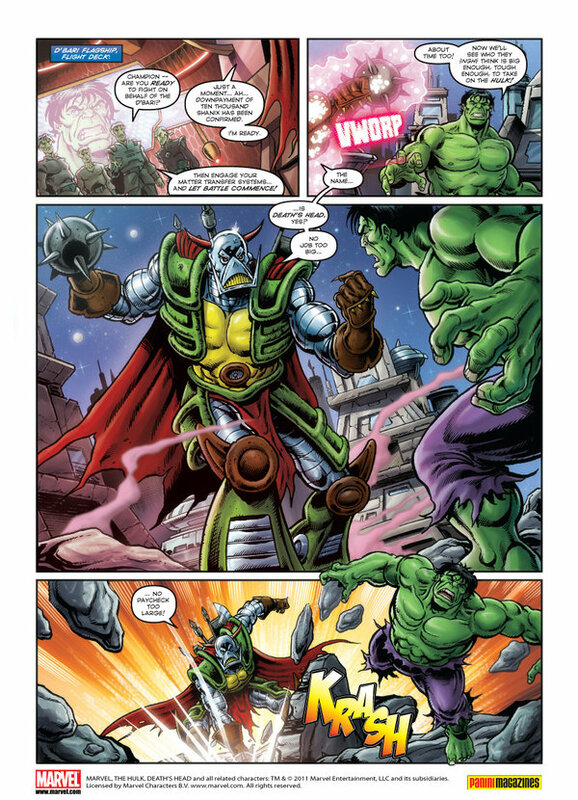 Ed Hammond had contacted me to draw a strip for Marvel Heroes issue 33. 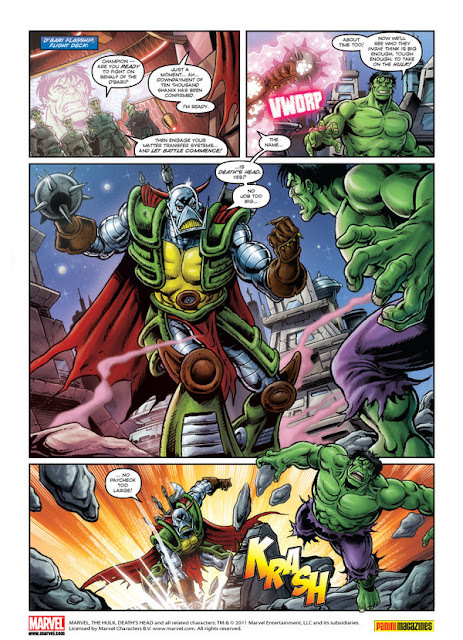 It was to be a Hulk story where ol' Greenskin would be in battle with... the original, one and only, in his debut Green costume/armour/Freelance Peacekeeping gear -- DEATH'S HEAD! 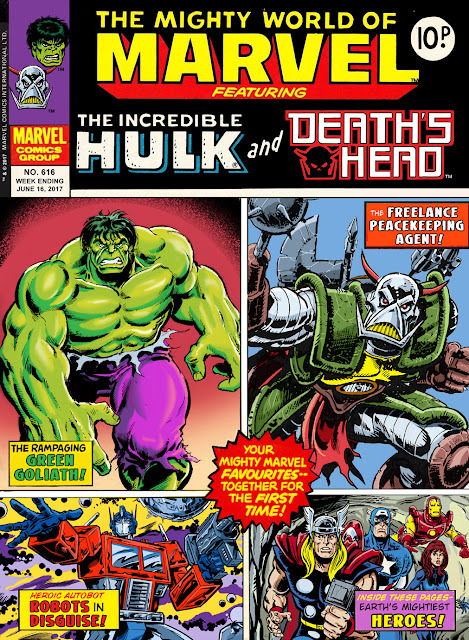 This was a dream come true for several reasons... as not only was it a battle I had wanted to see, and of course DRAW, but also it was finally the return of Death's Head, in his original form, to the world of Marvel UK and more importantly, comics! Mission accomplished, yes? So there you have it. If you are reading this, and you have a dream that you'd someday like to make happen... remember this story. I was told in school that I was wasting my time in regards to wanting to draw comics... and look what I've accomplished since then! If I can do it... you can too, yes? Drawn back in 1989! Check out that dynamic last panel! 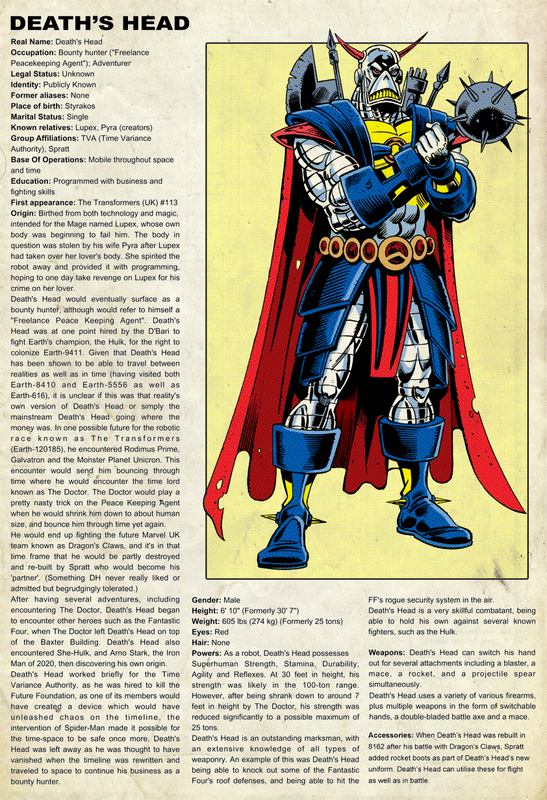 (and reprinted in the 2015 Marvel Heroes Annual). UPDATE: Added another character sketch of the design I plan on going for. ...what music they make (Bela Lugosi in the 1931 Universal Classic Dracula)! On this night where the Moon is full, and the Wolfbane is blooming... I thought I would share a teaser of my latest project. What If... Roddy McDowall had played the Doctor? 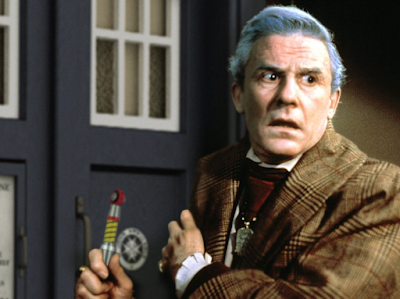 Whenever the current Doctor Who lead actor decides to leave the series, speculation always begins as to who will be the next person to pilot the TARDIS through time and space. This got me to thinking who I would have love see playing the greatest of the Time Lords. Even though this can sadly never happen, I like to think that in the multiverse of alternate realities, the great Roddy McDowall was once of the Doctor's incarnations... and that somewhere, somehow, he's still out there in time and space fighting the good fight! Here are some digital manipulations I decided to produce, showing the fearless Dalek Hunter in action! 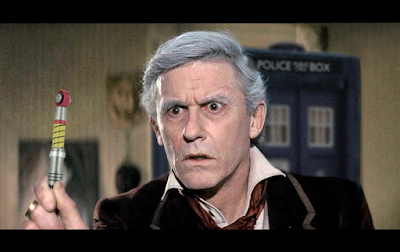 What if... Roddy McDowall played the Doctor! 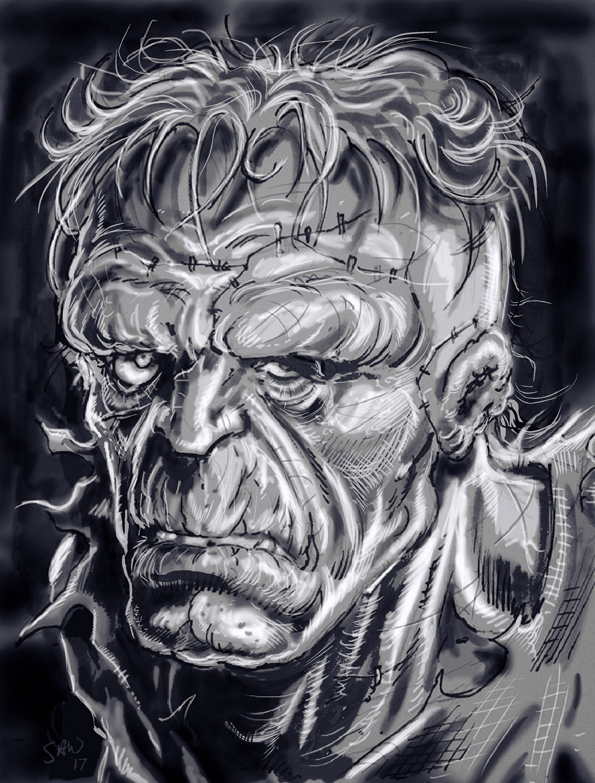 Here are some Digital pieces of how I imagine the different versions of the Hulk to look in the Marvel Cinematic Universe... plus one of his bashful, blue-eyed buddy from Yancy Street as well! Peter David and Dale Keown storyline. Guardians of the Galaxy vol.3? Let's make it happen, yes? Here's a recent Death's Head sketch that I decided to throw some colours on in Photoshop (threw gently I must add. Death's Head hates people throwing stuff at him). "James Gunn? Nice name, hrm? Ready for my close up now, yes?" 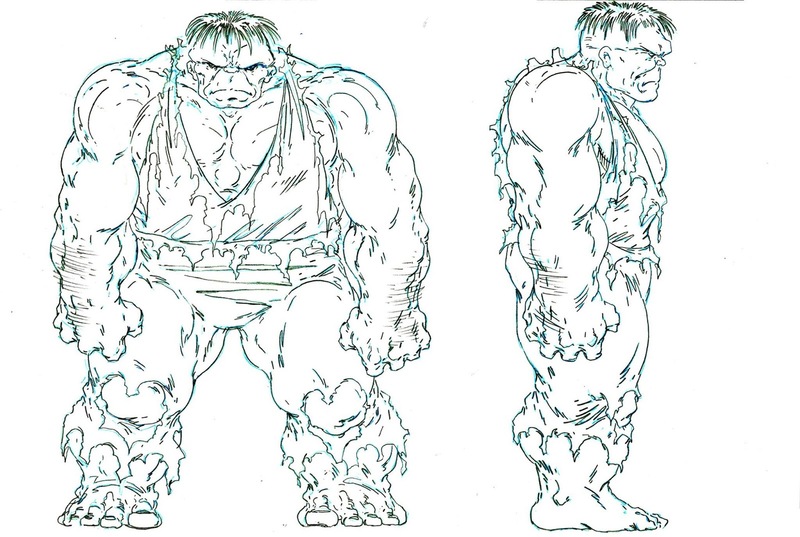 Being a life-long fan of the Incredible Hulk, it was ambition from a very young age to draw the character professionally... something I'm proud to say I've been able to accomplish on several occasions. Over the years, many artists have drawn the character through his various incarnations... bringing their own unique style to the green (and sometimes grey) goliath. I thought I'd present a list of my favourite artists to ever draw ol' Jade Jaws (and would that make the Grey Hulk ol' Grey Gums?). 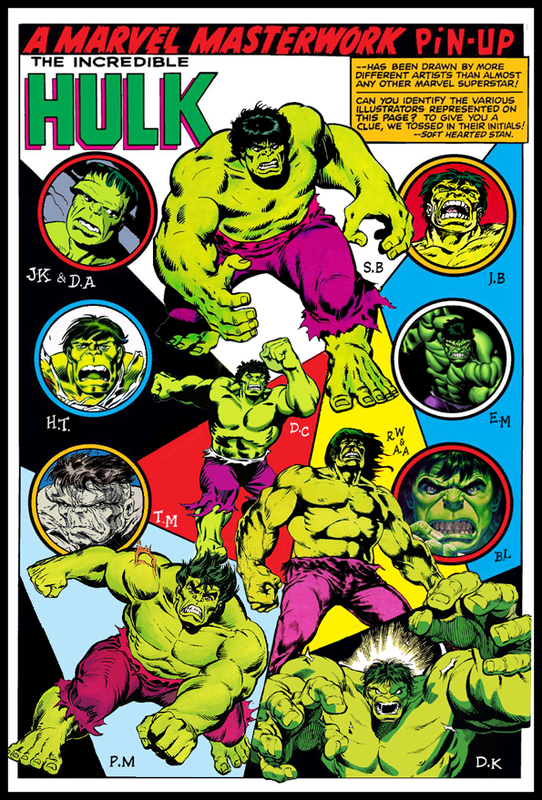 So, without further ado is my list of favourite artists to have drawn the Incredible Hulk! PS: Seeing as it's one of the more popular ones on this site. I've added a few more artists to the list. Read on, True Believer! 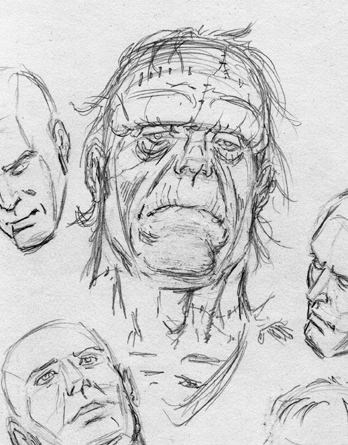 I've been drawing up sketches for tomorrow's Geekedfest, of which I'm a guest (more infomation here). 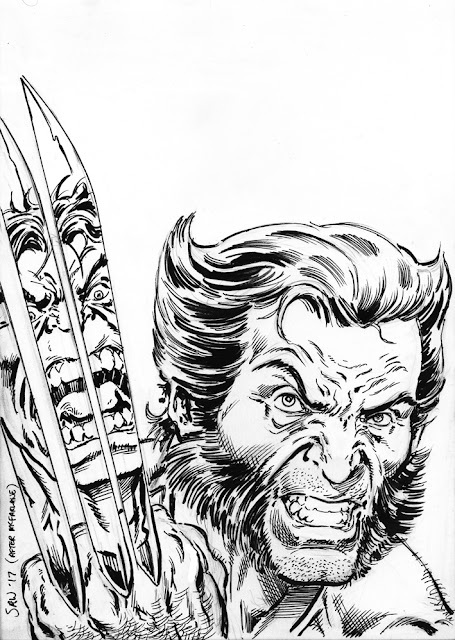 This sketch is one that I had an idea for recently: my own sketch homage to possibly one of the most homaged covers in comics, Todd McFarlane's epic cover for INCREDIBLE HULK issue 340, in which the Grey Hulk has one of his most brutal battles with the X-Men's Wolverine. 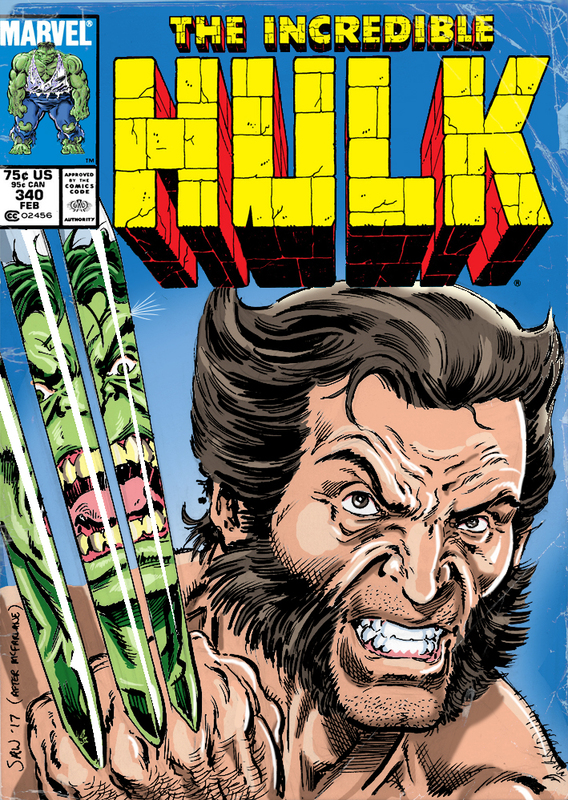 My sketch idea was for a Hugh Jackman movie-style Wolverine against a movie-style Hulk, although I'll admit my Hulk has turned out to be more comic-book like! After finishing the sketch, I decided to colour up a digital version, which I'm presenting here. 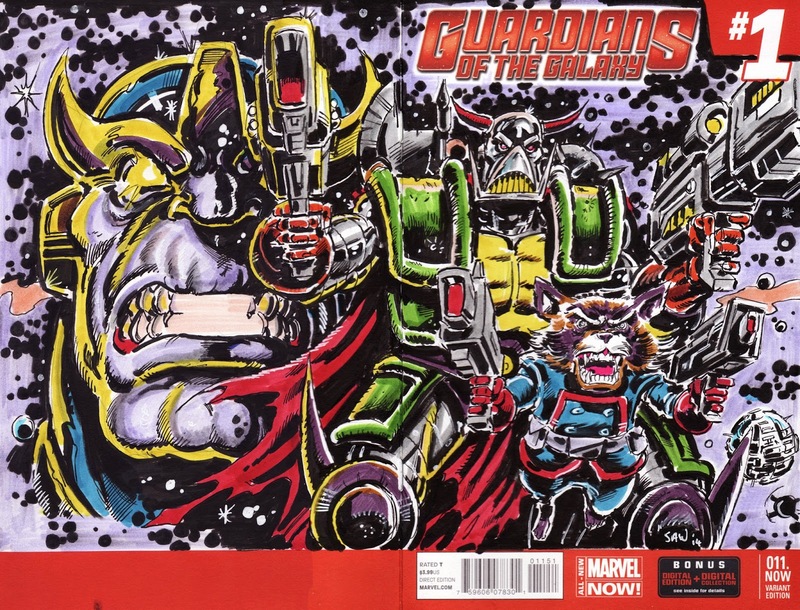 The original sketch (with free Funko Pop Hulk figure!!!) will be on sale tomorrow at the Geekedfest event, which is held at the University of Wales Trinity St David, Townhill Campus (where I studied back in the day!). So be sure to pop by my table, say hi and maybe grab a sketch! THE INCREDIBLE HULK issue 340. The original artwork, which will be on sale at tomorrow's Geekedfest. I found a turn-around style guide of the Grey Hulk drawn by Todd McFarlane (who along with writer Peter David, took the Hulk in a new and exciting direction in the late 1980s). 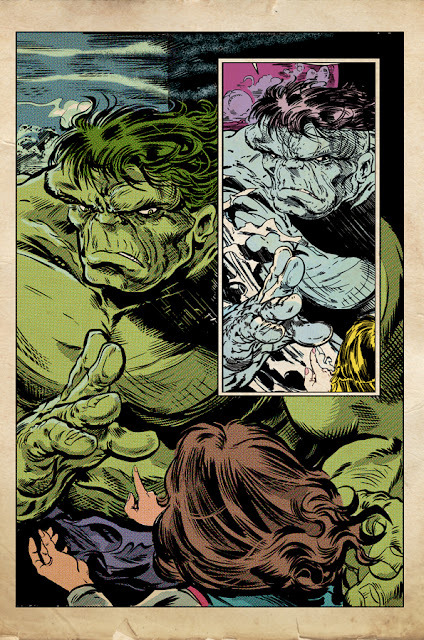 I've always been fascinated by Todd's version of the Hulk. 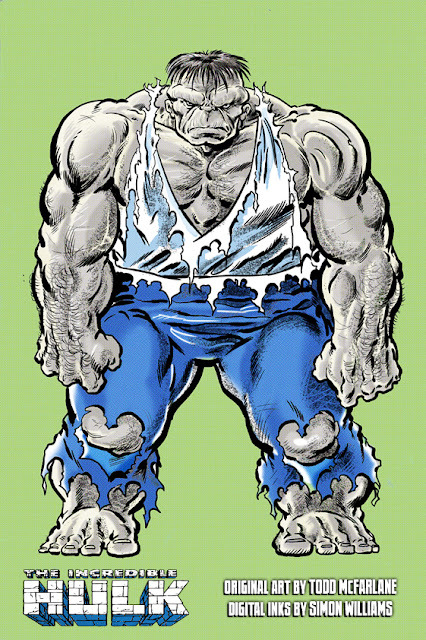 It was such a departure from any other version seen before due to his unique style, and far from the traditional classic style Hulk that I loved, as drawn by (in my opinion) definitive Hulk artist Sal Buscema... and yet, I loved it! 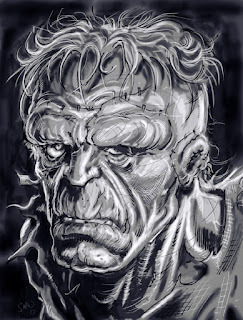 His Hulk captured the nasty, dark side of the character perfectly. 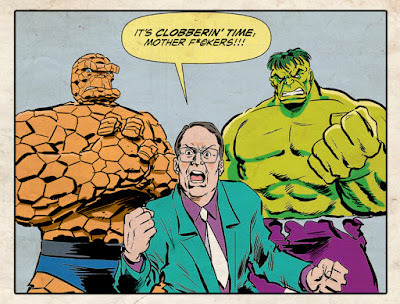 This definitely wasn't the old Green Hulk that loved puppy dogs, Bambi, and baked beans! 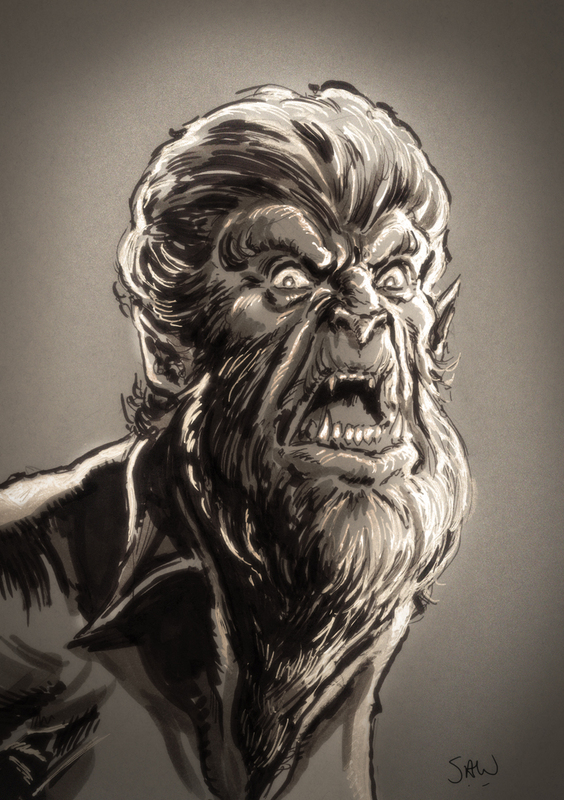 Anyway, I decided to practice my digital inking last night... and this is what I come up with. Despite our styles being worlds apart, it was fun inking this! I hope you like it. Inked using Manga Studio 4, and coloured in Photoshop. Todd's original artwork. Love this version of the Grey Hulk! 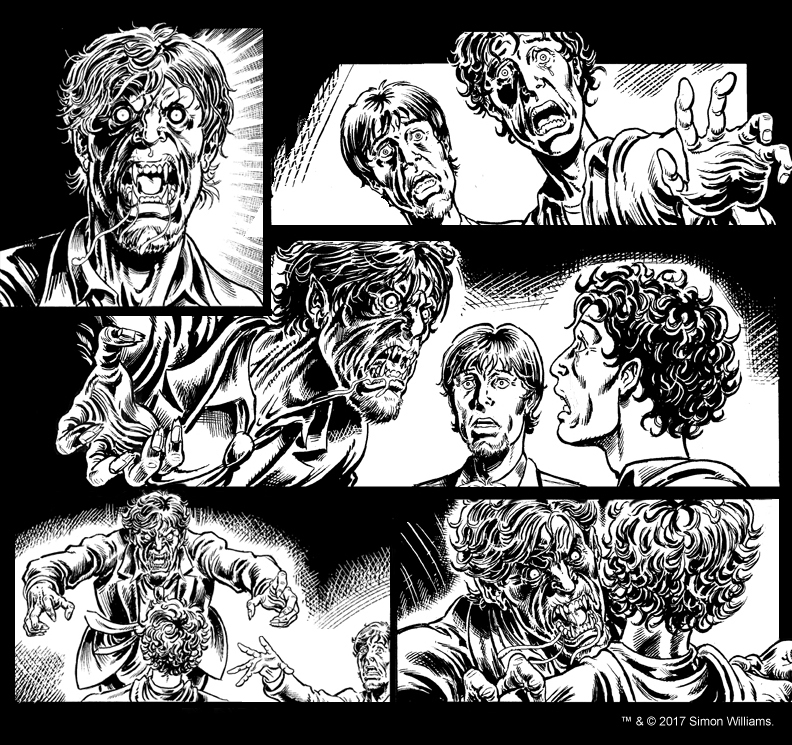 A previous attempt at inking Todd's artwork. You can read more about that here. 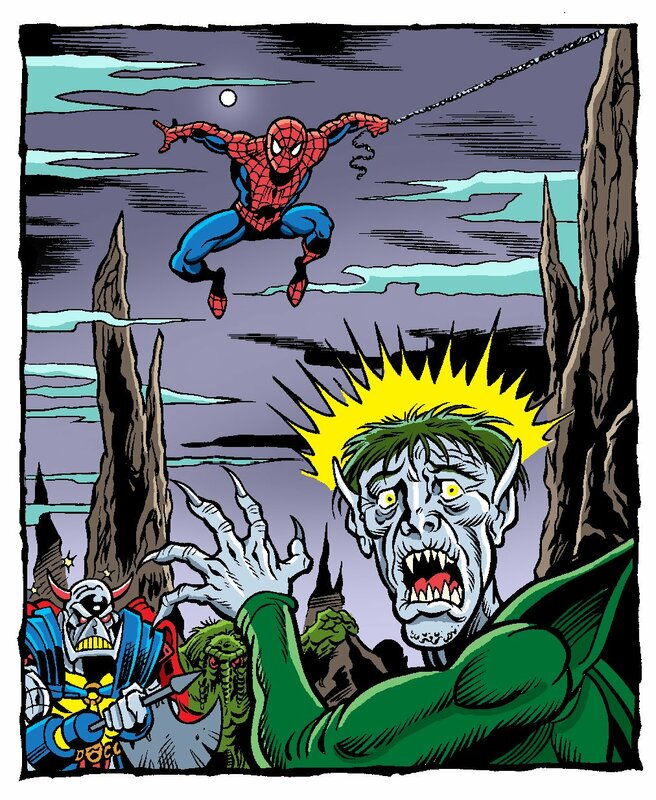 If you type in "Hulk vs Thing" in Google, one of the first images to show up is a panel from SPECTACULAR SPIDER-MAN ADVENTURES (UK) issue 100, where I achieved my life-long dream of drawing ol' Jade Jaws fighting Aunt Petunia's favourite ever lovin' blue eyed nephew... something I'll admit I'm really proud of! Legendary comic artists such as Jack Kirby, John Buscema, Jim Starlin, George Perez and the late great Bernie Wrightson have drawn a classic Hulk vs Thing battle, and while my work is nowhere near in their league, I'm proud to have been able to follow in their titanic steps! 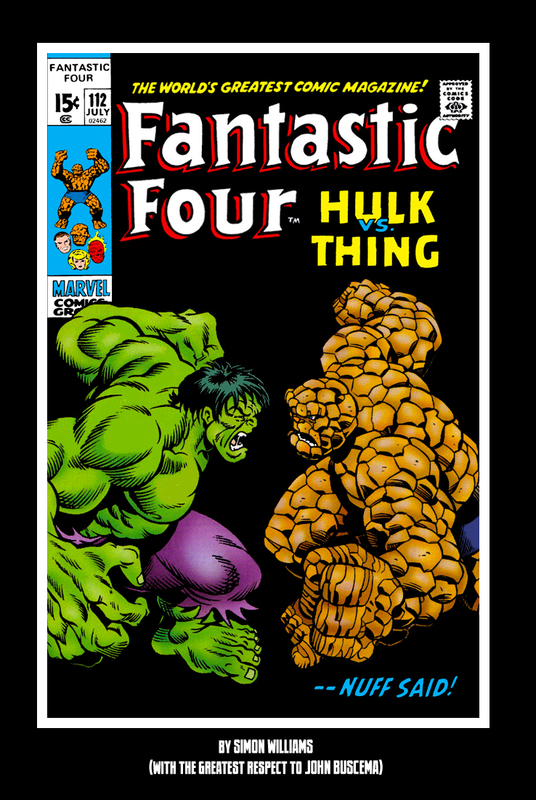 So I had the idea today to do a homage to John Buscema's iconic cover to FANTASTIC FOUR issue 112, using my artwork from Spec Spidey 100. 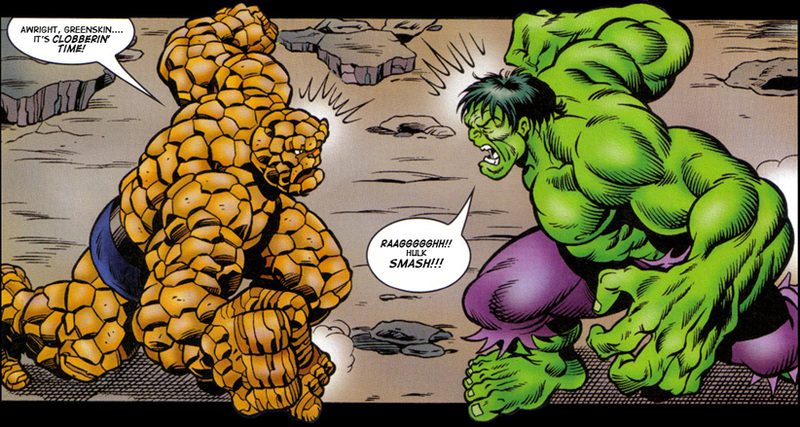 Hulk vs Thing... 'Nuff said! (published by Panini Comics). Pencils by Simon Williams, Inks by Simon Ecob. It's no secret that I'm a long-time wrestling fan... particularly the old-school style of wrestling from the good old days of the National Wrestling Alliance, as opposed to the current Sports Entertainment product of the WWE (which I do still enjoy). Recently I have had the honour of chatting online with the legendary (and now Twitter Verifed!) Kenny StarMaker Bolin. Kenny is a former pro-wrestling manager and commentator... who during his 20 year plus career worked for WWE's developmental promotion Ohio Valley Wrestling alongside his long-time best friend Jim Cornette (recently seen inducting the Rock N' Roll Express in the 2017 WWE Hall Of Fame!). During his OVW days, the StarMaker managed some of the promotions fastest-rising stars... including names such as Mike Mizanin (aka the Miz! ), Rico Constantino, Nick "Eugene" Dinsmore, Mark Henry and also some chap by the name of John Cena! 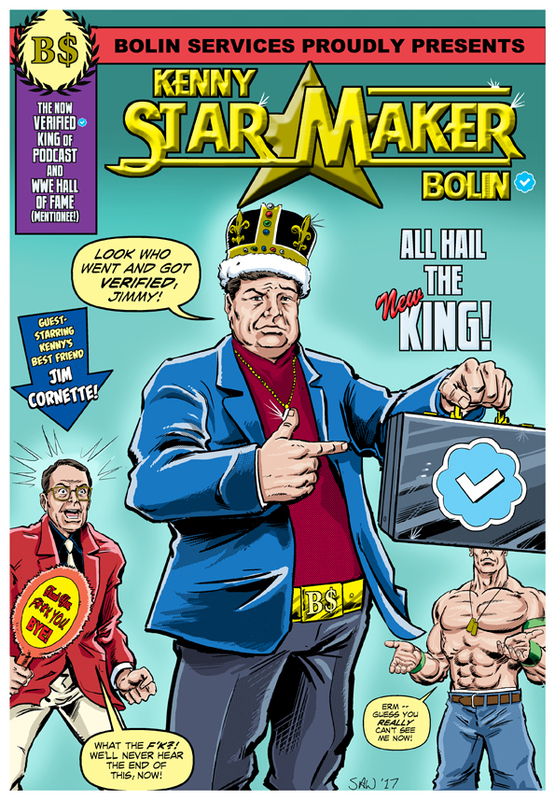 Since then, the King of Managers has written a book based on his Wrestling career called I Probably Screwed You Too: The Mostly True Stories of Kenny "Starmaker" Bolin, and is the host of the Bolin Alley podcast (which you can find on iTunes). Since chatting with the Star Maker on Twitter, Kenny commissioned me to do a piece of artwork for him, which I'm presenting here. I hope you like it... I had fun drawing this one, and the Star Maker is pretty damn pleased with it as well! I'd like to thank Kenny for the kind words regarding my artwork... be sure to give him a follow on Twitter, and definitely check out the Bolin Alley podcast! "DON'T call me a Bounty Hunter..."
You can read the strip here at my DeviantART page. I hope you enjoy, yes?